The Annandale Boys & Girls Club will be at tonight’s Annandale HS football game to officially present our $70,000 contribution to the Atom’s turf project. We are proud to provide our support to Annandale High School’s campaign to bring turf to AHS Bolding Stadium. This $70,000 donation will ensure AHS meets the minimum commitment for Fairfax County to bring turf to Annandale! ABGC is proud of our long and ongoing relationship with Annandale High School. Many of our youth athletes go on to become Annandale Atoms, contributing to their school, their teams and our community and we’re delighted to play a role in the lives of so many young people. ABGC has contributed 450,000 square feet of lush dark green grass with dark healthy green color and deep roots to our community’s Fairfax County public school fields . . . see the picture. Purchasing special order turf blankets recommended by the agricultural extension of Penn State University, ABGC has created a sea of deep green grass at many local neighborhood schools in the Annandale, Stuart, Falls Church, Woodson and Marshall pyramids. The project, started four years ago with a small order of turf blankets that are still in like new condition today and showing few signs of wear. Using special candy cane stakes these blankets have never been torn by wind or blown away. In fact every stake in every blanket has held firm year after year. The club fully expects the turf blankets to not only last the 8 years claimed by the manufacturer but well into a second decade, making their effective cost a very small fraction of the cost of traditional turf blankets sold by the roll. 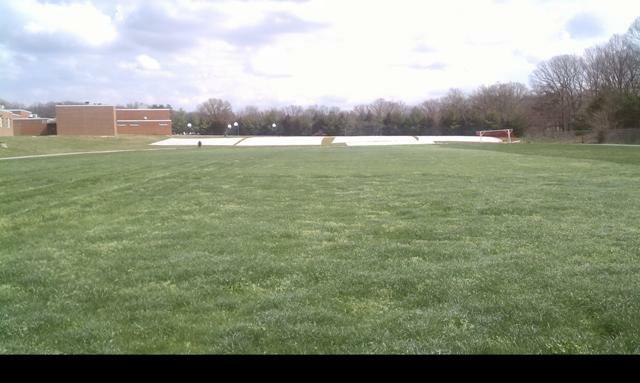 ABGC installs these blankets on school athletic fields used by our local public school students and our ABGC club sports played on local school fields by our over 5,000 member families who live throughoutFairfaxCounty. Turf blankets installed in late November, 2011 and removed 90 days later on February 20, 2012 for high school athletic teams produced 4 to 5 inches of lush green grass. On school fields not used by high school athletic teams blankets removed this week, 120 days after installation, revealed 10 to 11 inch tall grass which with a much deeper healthier dark green color. a much deeper root structure and a much higher chance of survival through the fall of 2012. To the faculty, staff, students and community served by Poe Middle School our gift is the sea of green in the attached picture for all to share and enjoy! The Germain Family, Kip ABGC President, Greg ABGC VP, Julie ABGC VP Treasurer and the staff of the Annandale Boys’ & Girls’ Club, Inc.